You are here: Home � All Deals , Electronics: Computers Video Games GPS , Featured � Get 5 PC games for $5 each - Rainbow 6 Vegas, Farcry2, Rayman Raving Rabbids, Heros V, and Brothers in Arms. Get 5 PC games for $5 each - Rainbow 6 Vegas, Farcry2, Rayman Raving Rabbids, Heros V, and Brothers in Arms. Amazon has five different Ubisoft Game Downloads available for $5 from now until the end of Wednesday 12/16. 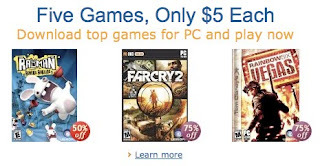 This offer saves you anywhere between $5-$15 on what these games would cost normally. The titles included in this offer are: Rainbow 6 Vegas, Farcry2, Rayman Raving Rabbids, Heros V, and Brothers in Arms.